Every big iOS update means that there is something new that awaits our explorer. In addition, it is strongly recommended that you follow each iOS update published by Apple, that it fixes a bug or brings new functionalities, because Apple always wishes to reinforce the security of its products during its update. In iOS 12, Apple has introduced many cool features in iOS, such as memoji and the FaceTime group. But sometimes, our iPhone does not install the downloaded iOS 12 update file. 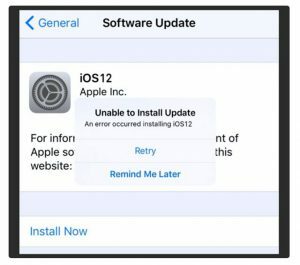 How to solve the problem if your iPhone / iPad says “An error occurred during the installation of iOS 12”? We’ll discuss here several tips if your device can not install the iOS 12 update. Apple has released iOS 12 on all compatible iPhone and iPad models. The update brings a lot of novelties and we would not be surprised if you could not control your enthusiasm. However, if your enthusiasm is blocked by a failure to update the iOS 12 software, do not worry. You can try some of the fixes that we have listed below to start your update. Let us dive to see more details about it. When the iPhone screen displays “Software Update Failed”, the first thing to do is tap “Close” in the message that appears to remove it from the screen. screen. Now you have to wait a while and start the procedure again. It can solve the problem here and there. If updating your iPhone’s software suddenly fails, it could be a problem with the network that creates the interrupt. It is very important to have a strong and stable network. Without this, you may not be able to complete an iOS update process. It would be better to simply reset the device and save a backup before doing so. 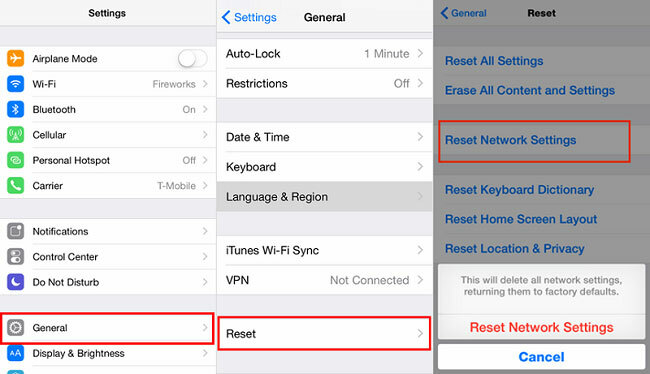 If you want to reset the network settings, you need to access the Settings app on your iPhone. Then look for “Reset” and click “Reset Network Settings”. After that, you may need to provide your password and simply confirm the reset. First of all, you have to download the firmware from the official website. The download will not be greater than 3 GB. The download will take a while. Next, you need to make sure that iTunes installed on your computer is the one being updated. Now you can connect your iPhone to the computer using a data cable. Once the device is detected, you need to access the “Device” icon at the top of the iTunes window and select the device. Now, tap “Check for Updates” in iTunes. After that, you have to find the firmware and install it by confirming “Download and Update” when the message is displayed. After that, iTunes will simply delete the previous version of iOS and install the updated iOS 12 on your iPhone. Download ReiBoot from the official Tenorshare website and install it on your computer. Then you have to launch the software and connect the stuck iPhone to your computer. Once the software has detected your device, you need to access the main ReiBoot interface and click on “Fix All iOS Stuck”. After that, the download will start. Once the operation is complete, simply click on “Start Repair” to repair the device. Once this procedure is complete with Tenorshare ReiBoot, you will not have to deal with any type of problem when using your update device.